February 9, 2017, Bethany, Conn. — LATICRETE, a manufacturer of globally-proven construction solutions for the building industry, has doubled the shelf life of nearly twenty of its bagged cement-based mortars and grouts, which now boast a two-year shelf life, thanks to advancements in the company’s plastic packaging that protects the material from water and air moisture. “While most products on the market must be disposed of after a year, our longer shelf life will allow distributors and contractors to store these mortars and grouts for an extended time, ultimately reducing their disposal costs for unused, expired inventory,” said Sean Boyle, Senior Director of Marketing and Product Management at LATICRETE. In addition to extending shelf life, LATICRETE’s durable new plastic packaging is also recyclable and reduces breakage, as well as offers information and instructions in three languages (English, Spanish and French). 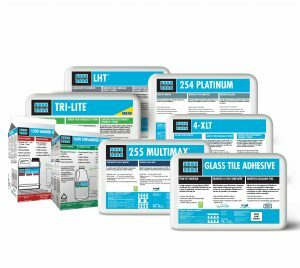 Products include 254 Platinum, 255 MULTIMAX™, 253 Gold, 252 Silver, 4-XLT, 125 Sound & Crack Adhesive, 211 Powder, 3701 Fortified Mortar, TRI-LITE™, LHT™, 317 Floor & Wall Mortar, Glass Tile Adhesive, 226 Thick Bed Mortar, 1500 Sanded Grout and 1600 Unsanded Grout.